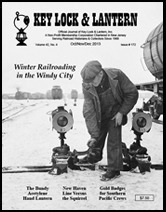 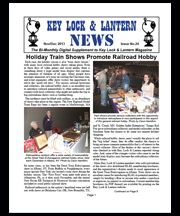 Holiday Railroad Hobby Shows, Gaithersburg Railroadiana Show, Brookline Railroadiana Auction, Union Pacific Big Boy Begins Journey, Norfolk Southern Donates to 611 Restoration, KL&L Convention & Nominations Updates, Want Ads & Railroad Event Calendar. 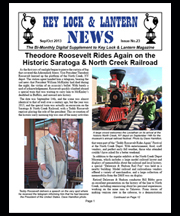 Teddy Roosevelt & Leviathan on Saratoga & North Creek RR, KL&L #171 Highlights, Railroad Memories Auction, Preservation News: Adirondack Scenic, Portage Viaduct, Norfolk Southern Exhibit Car, CSX Signals, DL&W Mt. 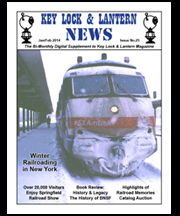 Morris Depot, California RR Museum, Museum of American RR, etc., Book Review: Oneida Railway, KL&L Advertising Guide, Want Ads & Calendar. 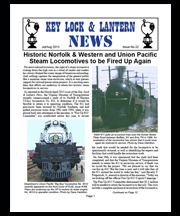 Norfolk & Western J-Class No. 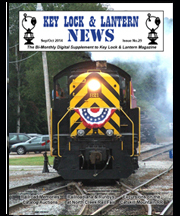 611 steam locomotive, Union Pacific Big Boy, Western Maryland Railway history & museum, Railroad Memories auction, KL&L YouTube Channel, Want Ads & Event Calendar. 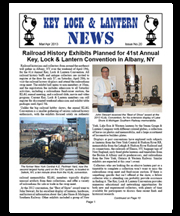 Key, Lock & Lantern Convention, Grand Central Terminal Parade of Trains, Soulis Auction Report, Brookline Auction Report, Adirondack RR Returns to Big Moose, Union Pacific Steam Schedule, Amtrak Unveils New Exhibit Train, Lancaster Lock Show, Want Ads & Event Calendar. 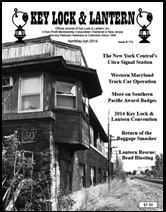 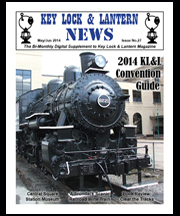 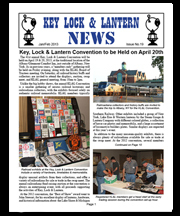 Upcoming Key, Lock & Lantern Convention, Amtrak History & Archives Web Site Review, KL&L Magazine Highlights, Norfolk Southern 21st Century Steam, N&W 611 Restoration, Long Island Locomotive Heads for Strasburg, National Train Day, Grand Central Terminal Show, Reading Museum, Want Ads & Event Calendar. 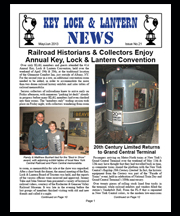 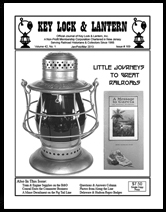 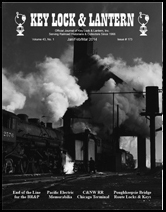 Upcoming Key, Lock & Lantern Convention, Springfield Railroad Hobby Show, Railroad Memories Auction Report, Kansas City Southern 125th Anniversary, New Amtrak System Timetable, Want Ads & Event Calendar.